Union Home Minister L.K. Advani today ruled out any immediate military de-escalation along the Indo-Pak border and said it would take a “couple of months” for India to judge whether there was any reduction in Pakistan-sponsored cross-border terrorism. Home Minister L. K. Advani talks to journalists in New Delhi on Friday. Mr Roger Chugh, the first Asian-American to have been appointed Assistant Secretary of State, has said feelings of Americans towards Pakistan have changed after the September 11 attacks and the USA is coming out far more openly in support of India’s concerns on cross-border terrorism. The Election Commission (EC) today warned governments in states going to Assembly polls next month not to waive off loans or enhance loan limits during the election period as this could upset a level playing field and vitiate the poll process. The Maharashtra Government-appointed Kurdukar Commission has begun its probe into the power purchase agreement of Enron-promoted Dabhol Power Company. 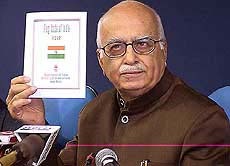 Home Minister L. K. Advani launches Flag Code of India 2002 at a Press conference in New Delhi on Friday. “These are matters on which a formal decision is taken by the government. At the moment, the present situation on the border will continue,” Mr Advani told newspersons here during a press conference called to announce the relaxation in the use of the tricolour by the general public. Mr Advani made it clear that the government would require at least two months to judge whether there was any let-up in cross-border terrorism, with Pakistan President Pervez Musharraf having pledged to combat the menace in his January 12 address to the nation. On the list of 20 wanted terrorists and criminals given by India to Pakistan, the Home Minister said New Delhi had not set any time frame for their deportation. “I hope the Pakistan Government will agree with the request of the Government of India since Islamabad has declared to fight terrorism,” he said, adding that he also hoped that Islamabad would not provide asylum to any terrorist. Mr Advani replied in the negative when asked whether the visit of US Ambassador Robert Blackwill to the Line of Control (LoC) in Jammu and Kashmir amounted to accepting Washington’s mediation to resolve the Kashmir issue. “During the past three to four years, the government has allowed many Ambassadors to visit Kashmir but that does not mean we have agreed to mediation on it,” he said. Earlier, Mr Advani released the amended Flag code, which will come into force from tomorrow, under which the Tricolour can be freely hoisted by people atop their houses. “There shall be no restriction on the display of the national flag by public or private organisations and individuals and can be hoisted on all days,” Mr Advani said, adding that this is a gift the government wanted to give to the countrymen on Republic Day. “Let there be no household in the country which does not have a national flag. Let it be used properly, kept with due respect and due reverence,” Mr Advani said. Expecting that the government’s move would be welcomed by the people, he said the restrictions, which have now been considerably reduced, would include use of the flag for commercial gains, or as part of drapery and dress material or to cover a dais or a platform. The flag should neither touch the ground or water nor be draped on vehicles or printed on a costume. Asked whether there should be a special law to prevent its misuse, the Home Minister said there was no need to enact such a law. 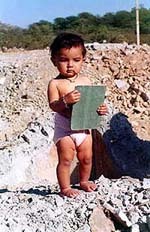 The Union Cabinet had on January 15 approved the recommendations of the Flag Code Committee headed by Dr P.D. Shenoy of the Union Home Ministry and comprising representatives of the Ministry of Defence, Culture, Legal and Company Affairs. Mr Chugh, who took over as Assistant Secretary of State, New Jersey, about 10 days back, said the USA had stood behind India after the December 13 terrorist attack on Parliament House. “It is not in the USA’s interest to give up Pakistan, but feelings among American people have changed and the US President listens to the feelings of people who realise that Pakistan is a terrorism-sponsoring state,” he said. Mr Chugh, a Punjabi who had his education in Delhi, said world leaders were visiting India and Pakistan to avoid a nuclear conflict in the present atmosphere of tension between the two countries. He said people in the USA wanted Pakistan to act beyond words. Mr Chugh said the Indian-American community endorsed the position which the BJP-led government had taken after the Parliament House attack. During his four-year term as Assistant Secretary of State, Mr Chugh said he would work towards getting the Indian community more integrated in the mainstream. He said there were an estimated three million Indian-Americans of whom 1.2 million were voters. Asked about the problems of Indian-Americans, he said instances of “racial profiling” did occur but the US Government had taken strong steps to check it. Mr Chugh will be honoured by the Overseas Congress at a function in the USA on January 26. In a letter to the chief secretaries of all states and union territories going for polls, including Punjab and Uttar Pradesh, the Commission has directed that all financial institutions funded partly or wholly by the state governments, should not write off loans advanced to any individual, company or firm during the period the Model Code of Conduct is in force, without prior permission of the Commission. Similarly, the financial limits that these institutions have to adhere to while granting or extending loans should not be enhanced by issuing loans indiscriminately to beneficiaries, the EC said. The EC directive is understood to have been issued following fears that some public financial institutions in the states going to the polls next month were trying to waive off loans to big business and industrial houses. While assembly polls are to be held in Uttaranchal, Uttar Pradesh, Punjab and Manipur, assembly and Lok Sabha byelections are being held in several other states. The Commission said that “whereas this normal activity (rescheduling of loans, writing off bad or defaulted loans) of such state government institutions may go on during non-election period, these activities when the election process is under way, sometimes, get vitiated and are looked upon with suspicion by political parties, candidates and general public. “It cannot be gainsaid that the party in power which wields considerable influence over the government of the day and which is also contesting the elections to get back to power, can get bad or defaulted loans to be written off, giving rise to allegations that the person or business house whose loan is being written off makes contributions to the party coffers to help them in their election campaign. “There could also be the other abuse of a flurry of loaning activities of a populist nature aimed to garner votes which would, in the long run, affect the health of the loaning institution itself,” the Commission observed. The EC directed the chief secretaries to bring this order to the notice of all financial institutions immediately. The commission, headed by former justice S.P. Kurdukar, was appointed last September following the Democratic Front government’s decision to institute a judicial probe into the controversial deal of the 2,184 mw power project at Gugaghar in coastal Konkan. The commission will probe the veracity of the documents submitted by Enron and the validity of the agreements, including default, if any by the then state government machinery, official sources said here today. Former Prime Minister and Samajwadi Janata Party leader Chandra Shekhar who had been under medication for hypertension at Batra Hospital for three days was discharged today. Mr Chandra Shekhar’s nephew, Praveen Singh said his uncle had hypertension due to exertion. Mr Chandra Shekhar’s blood pressure is in control and he plans to set out for Patna on Monday from where he will proceed to his constituency, Ballia, and other places in Uttar Pradesh for election campaign,” he added.